Stanford University, or your own lyin’ eyes? Interesting story in yesterday’s Times on a divorce case at Stanford’s business school that cracked open a window on the question of gender discrimination at the school and at the Hoover Institute, the right-wing academic bolus hawked up onto Leland Jr.’s farm. John Etchemendy, Stanford’s provost, would not discuss the claims about the business school and Hoover in detail. He said that Stanford had hired separate outside investigators and that neither had found systemic discrimination. But he acknowledged “weaknesses in management” and said they were being addressed. At the Hoover Institution, which has been a haven for former Reagan and Bush administration figures including George P. Shultz and Condoleezza Rice, a departing employee wrote a seven-page letter to Mr. Etchemendy detailing a “dysfunctional” atmosphere of “cronyism” in early 2013. That spurred Stanford to begin an investigation. Hoover has 181 full-time employees, more than half of them women, but the research and senior fellows are overwhelmingly men. A new director at Hoover started last month. The investigation faulted Hoover’s leadership for not casting a net wide enough to bring in new faces. One cultural problem, it said, was membership by Hoover’s leaders in the Bohemian Club, an all-male private club in San Francisco that dates to 1872. Ms. [Debra] Zumwalt cautioned against reading too much into the Hoover report’s conclusions. Oh, counsellor! I know you’ve got a job to do — but is that all you’ve got?! #WeakSauce, I’d say. Snark over: anyone who labors under the misapprehension that the United States is an equal-opportunity meritocracy isn’t paying attention. But you knew that. Which is reason ∞ why, whatever the failings of the donkey party, there is a difference between a party that explicitly acknowledges that sad fact, and one that denies the plain evidence of their own lyin’ eyes. 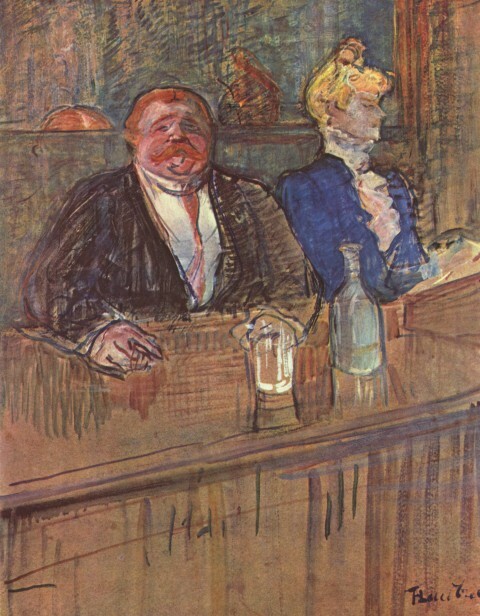 Image: Henri de Toulouse-Lautrec, In the Cafe, 1898.